Available to distributors across the nation, our Portuguese wines are available at extremely attractive prices. Celebrate fine wines today! In 1999 Impact Databank ranked Presidential as one of the ten leading imported brands of port in the US. The brand has won several international awards and has enjoyed glowing reviews by well-known wine writers. A classic deep ruby color, this delicious dessert wine combines youthful fruitiness with a surprisingly soft complex style rarely found in younger Portos. A supple, fruity, style of Tawny, the Tawny Porto combines velvety sweet nut and fruit flavors with good balance and a long pleasant finish. In Portugal, this plump, juicy white port is best served on the rocks with a twist, or just well chilled. Rich, plummy-vanilla flavors with a flash of sweetness make this wine a delicious aperitif. Experience the lively aroma of plum, cherry, and vanilla. The rich, full, caramel flavors are enhanced by a long, lush, buttery finish. It is also slightly sweet. Elegant and complex, this 20-year-old tawny marries an intense nutty flavor with butterscotch and oak. It is a wine of exceptional character with a nice sweet finish. Our 30-year-old tawny is a gold medal winner for the Best Port Wine at the 2001 International Wine & Spirit Competition in London. A decadently delicious wine with mature full fruit and nut flavors, it is very complex and has an incredibly long finish. Deliciously sweet with a youthful racy freshness from the addition of younger Port, the 40-year-old tawny has an extremely long and complex finish reminiscent of aged Madeira. 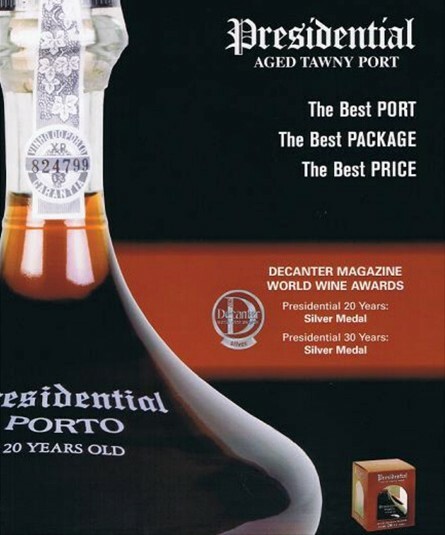 The year 2000 was possibly one of the most spectacular years ever in the history of vintage port. Our Porto 2000 was left in casks 4-6 years before bottling. With a harmonious blend of ripe fruit flavors, it is ready to drink now.